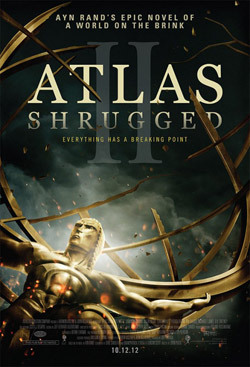 Atlas Shrugged: Part II Movie Trailer Arrives. Samantha Mathis, Jason Beghe and Patrick Fabien star in the sequel based on Ayn Rand’s epic 1957 novel. Watch the movie trailer for Atlas Shrugged: Part II below. With the global economy on the brink of collapse, Dagny Taggart (Mathis) discovers what might be the answer to a mounting energy crisis and races against the clock to prevent the motor of the World from being stopped for good. MPAA Rating: (PG-13) for brief language. The global economy is on the brink of collapse. Unemployment has risen to 24%. Gas is now $42 per gallon. Brilliant creators, from artists to industrialists, continue to mysteriously disappear at the hands of the unknown. Dagny Taggart, Vice President in Charge of Operations for Taggart Transcontinental, has discovered what may very well be the answer to a mounting energy crisis – found abandoned amongst the ruins of a once productive factory, a revolutionary motor that could seemingly power the World. But, the motor is dead… there is no one left to decipher its secret… and, someone is watching. It’s a race against the clock to find the inventor before the motor of the World is stopped for good. Who is John Galt?